Help Stalleo take back Treva's Watch. Talk to Stalleo outside Treva's Watch. Enter Treva's Watch through the secret tunnel. Open the Treva's Watch main gate. You will find Stalleo next to a campfire along the narrow dirt road just outside of Treva's Watch. Mistaking you for a mercenary, he will tell you that invaders kidnapped his family and took possession of the fort while he and his bodyguards were away fighting in the war. He will tell you that his family is inside, and ask you to use a nearby secret tunnel (Treva's Watch Escape Tunnel; the "back door" in your journal) to access the fort, fight your way through, and then use a lever from inside to open the front gate for him. Enter the nearby tunnel indicated by your objective marker. Inside, and around the first corner, three bandits stand at the top of some steps. Shooting down the lamp above them will cause an explosion. A fourth bandit lurks in the adjoining room. You will also find some chests and soul gems there. There is a bear trap on the floor in the next hallway. Follow the hallway and ascend the stairs to find a bandit working at an anvil in the room straight ahead of you. He is facing away, facilitating a sneak attack. Through an open doorway is a small storage room containing the corpses of two Nords and an Imperial. It is possible that this is Stalleo's family, but they are not identified as such. Enter through the door into Treva's Watch. Two bear traps lie on the floor just around the turn. Ahead, you will hear two bandits conversing at the top of a stairway. Dispatch them and climb the stairs to find a short ramp ahead leading up to a somewhat crooked hallway. There are two bandits in a bedroom fairly near and to the right. Use caution when engaging these bandits, as the noise from this battle can alert 1-4 other bandits in nearby rooms, including a Bandit Chief and a powerful spellcaster. One way to try to avoid this is to provoke the initial two bandits, then immediately run back in the direction that you came, letting them chase you to fight out of earshot of their allies. In the bedroom, you can find a few potions, including a Potion of Brief Invisibility. Directly across the hall from this, behind a locked door, is a small treasure room. At the end of the hallway, turn right. If you have not already killed the Bandit Chief, he or she will be sitting at a desk in the bedroom up ahead to the left. Again, a noisy battle here can attract the attention of a large nearby group of bandits. The chief will be facing away at a desk, so if you can make it into the room undetected, a sneak attack is possible. A Spell Tome: Bound Sword sits on the chief's desk. Proceeding further into the fort, you will next find yourself on the upper tier of a large dining hall where several bandits are seated. Be prepared for a tough fight, as they will swarm you once alerted and at least one of them will be a powerful mage. A fourth bandit will likely be drawn into the fray from the nearby kitchen area. Make your way through the kitchen and pantry then proceed through a wooden door. To the left is a pressure plate that activates a spike wall trap which can permanently pinch you against the stone wall. This is most likely to happen if a follower or enemy steps on the trap and you manage to get behind the spike wall after it is activated. Proceed around it with caution and make sure that a follower does not set it off. After passing through a medium-sized room containing more smithing materials, you will reach a spiral staircase leading upwards into the fort's tower. Climbing it, you will find two more bandits, including another Chief, and a boss chest. It is also possible to ignore the tower and continue on to complete the quest, but you will miss some treasure. The room at the top contains the enchanting skill book Twin Secrets, and a Spell Tome: Courage sits on a wooden table near the Arcane Enchanter. Up on the tower roof is another chest. You can save yourself some trouble later by standing at the east and south edges of the tower roof and killing with ranged attacks all of the bandits below you on the rooftop encampments and in the courtyard. If you took the stairway, return down and turn right into the hallway. Three leveled bandits await in a guards' room off the left of the hallway. This room contains two locked, empty jail cells. Past that room is a dart trap activated by a pressure plate. Beyond this trap, a door to the left exits into the fort's front courtyard. Continuing straight past this door leads to a pressure plate trap which will release a swinging mace down into the area in front of the chest you can see ahead. Standing on the plate and waiting for the mace to fall will let you avoid receiving any damage. Once you exit the door, you will find the lever immediately to your left. Unless you have killed all or some of them from the roof of the tower, there will be five or six bandits patrolling the courtyard, most of them guarding the front entrance from elevated platforms and rooftops. If you use the lever to open the entrance gate, Stalleo and his bodyguards will rush in from outside to help you fight them. Stalleo is a wizard and can help greatly in battle, but if you prefer, you can fight the bandits here on your own before opening the gate to let him in. When all the bandits are dead, letting Stalleo know that he's regained possession of his home will complete the quest. When he asks about his family, you only have the option to say that you did not find them. He will then reward you with the Spell Tome: Detect Life. 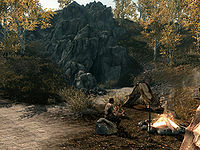 After the quest has been concluded, Stalleo and his men will return to their campsite and remain there for the duration of the game, leaving the fort to eventually become occupied by new groups of bandits and their chiefs. It is possible to jump the rocky path to the left of the tunnel into Treva's Watch, and activate the lever, but this will not update the quest unless you enter and immediately exit the tunnel before taking the shortcut. If you clear out Treva's Watch before accepting the quest, you can complete it by closing and then reopening the lever. This may leave all objectives marked as incomplete. Bandits in the first level of the tunnel will not follow you out to Skyrim, and will remain in the same initial positions when you enter the tunnel again. One Iron Ore vein can be found by walking west to the riverbank from the westernmost part of the fort's exterior. One treasure chest behind a tent on the rooftop perimeter may be hard to see if you're not looking for it. It is possible to jump the wall from the rubble on the side, so you do not have to clear out the entire fort; just go in and out via the back entrance, then jump the wall and pull the lever. Brurid, the man Stalleo holds responsible for the current situation, is mentioned in conversation by bandits in the fort as being present but he is never encountered. The quest objectives don't update to indicate completion. An sqs query resolves this. 100 Finishes quest I have discovered a back way into Treva's watch and was able to open the main gate from the other side. The following empty quest stages were omitted from the table: 1. On the PC, it is possible to use the console to advance through the quest by entering setstage dunTrevasWatchQST stage, where stage is the number of the stage you wish to complete. It is not possible to un-complete (i.e. go back) quest stages, but it is possible to clear all stages of the quest using resetquest dunTrevasWatchQST. This page was last modified on 7 April 2019, at 17:58.